|'''Overview''' || Students will follow and implement a beginner level java-based Test Driven Development (TDD) approach with JUnit in the Eclipse IDE. First, they create a test case that fails, then they start creating mock code, and finally a simple piece of code that allows their test to pass. Students will follow and implement a beginner level java-based Test Driven Development (TDD) approach with JUnit in the Eclipse IDE. First, they create a test case that fails, then they start creating mock code, and finally a simple piece of code that allows their test to pass. It is assumed, as per the prerequisites above, that students have already learned about TDD. However, if teacher or students need some content to start on, the best quick dummies guide would be this [https://www.youtube.com/watch?v=QCif_-r8eK4 YouTube video summarizing TDD], and this [http://www.agiledata.org/essays/tdd.html graphical explanation of the TDD process]. If you want more extensive TDD learning content, check out Kent Beck's [http://www.amazon.com/exec/obidos/ASIN/0321146530/ "Test-Driven Development by Example"]. He is the inventor of TDD and wrote JUnit, the focus of this exercise. Additionally, see how a [https://users.csc.calpoly.edu/~djanzen/courses/405W10/presentations/TDD.pdf CalPoly] and [http://www.cs.cofc.edu/~bowring/ College of Charleston] class used TDD in their studies. For more resources, and ideas on secondary TDD exercises, see the [[#Appendix|Appendix]] of this page. It is assumed, as per the prerequisites above, that students have already learned about TDD. However, if teacher or students need some content to start on, the best quick dummies guide would be this [https://www.youtube.com/watch?v=QCif_-r8eK4 YouTube video summarizing TDD], and this [http://www.agiledata.org/essays/tdd.html graphical explanation of the TDD process]. If you want more extensive TDD learning content, check out Kent Becks [http://www.amazon.com/exec/obidos/ASIN/0321146530/ "Test-Driven Development by Example"]. He is the inventor of TDD and wrote JUnit, the focus of this exercise. Additionally, see how a [https://users.csc.calpoly.edu/~djanzen/courses/405W10/presentations/TDD.pdf CalPoly] and [http://www.cs.cofc.edu/~bowring/ College of Charleston] class used TDD in their studies. For more resources, and ideas on secondary TDD exercises, see the [[#Appendix|Appendix]] of this page. The method of how developers go about implementing code is varied. Test driven development is one such method stemming in the 2000's that has gained momentum as an accepted and [https://tuhat.halvi.helsinki.fi/portal/files/29553974/2014_01_swqd_author_version.pdf research-proven] method for increasing software quality, readability, and reliability. Testing software to assure that it works within particular constraints is an extension of quality assurance (QA) efforts that most professional software products enact to increase their products value. With TDD, this testing is built-in even ''before'' students write their first line of code. This means that students will have a better grasp on ''what'' they are programming and why. It means that students will have code that not only works when they first implement it, but that will continue to work when others develop next to it and run the same tests. 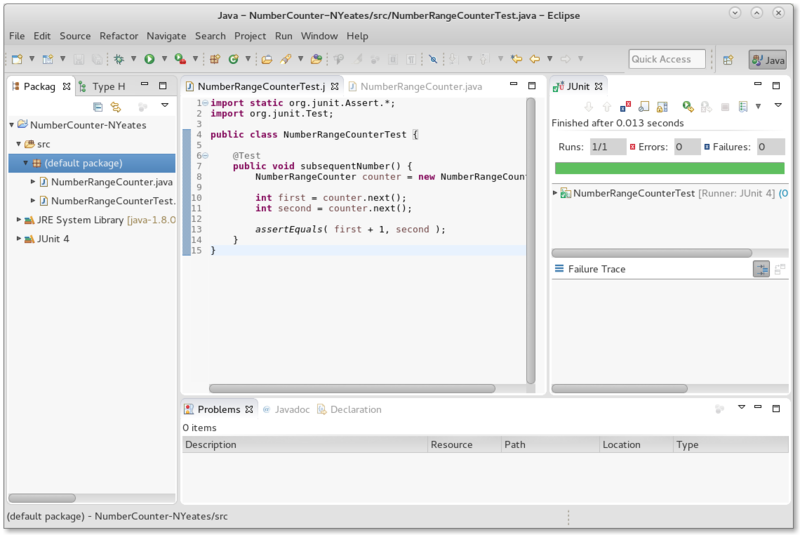 * Test code and implementation (SUT) code that, together, make a successful test case (green in Eclipse JUnit). * Show students any unit testing or TDD-based development you may already have in place. A real life example, with an explanation from a community developer would be a perfect way to solidify the understanding that testing is necessary for real world software. It is assumed, as per the prerequisites above, that students have already learned about TDD. However, if teacher or students need some content to start on, the best quick dummies guide would be this YouTube video summarizing TDD, and this graphical explanation of the TDD process. If you want more extensive TDD learning content, check out Kent Beck's "Test-Driven Development by Example". He is the inventor of TDD and wrote JUnit, the focus of this exercise. Additionally, see how a CalPoly and College of Charleston class used TDD in their studies. For more resources, and ideas on secondary TDD exercises, see the Appendix of this page. This page was last modified on 8 September 2018, at 12:16. This page has been accessed 25,619 times.